Brian Timmons was an idealistic young man, after watching the propaganda reels in the local movie halls of smiling soldiers on their way marching to battle influenced him greatly. He signed up with the second battalion of the 103rd Rhode Island field artillery regiment battery C. The regiment shipped out to England in October 1917, and then moved to France in November, Brian was stationed at Camp de Coëtquidan, an artillery camp in Brittany built by Napoleon in 1804. He and his comrades were upbeat and full of energy and enthusiasm, but the French and British troops that he saw there, weren’t the happy smiling Tommy’s from the movies, but battle weary souls near to breaking point. Conditions at the camp through that long, cold and rainy winter were very primitive. Food and fuel were scarce, the barracks were poorly heated and ventilated, and candles provided the only light. The soldiers of the 103rd were growing restless. They knew how to use their howitzers but wanted to put the knowledge and skills to practical use. On February 2nd 1918, new English gas masks were issued, there was the sense among the more astute soldiers that something was going to happen soon. Two days later the regiment was on its way to the Western Front. The 103rd’s first deployment was at Chemin-des-Dames, by the end of March, the 103rd was sent to defend the Toul sector, a move that involved an exhausting fifteen day hike through mud and rain. Life got harder for the Yankees long before it got better. On July 15th the Germans launched a general attack along the line. From Toul the division was hurled into fury of the Champagne-¬Marne defensive,” and from there into the brutal Aisne¬-Marne campaign, the Second Battalion was sent into the rat infested trenches for the first time. Life on the Western Front was pure misery for the men from Rhode Island. With constant dangers each day and night, as the Germans’ ruthless bombardment. The soldiers had to live underground to escape the fire above. Trenchfoot was a constant problem, while rats ran through the trenches nibbling on everything in sight. Horrible food, and tainted water added to the misery through disease. Gas attacks were a constant threat as well; no soldier went anywhere without his gas mask. In addition to these threats, aircraft would occasionally bomb and strafe their positions. In October 17th, when the 103rd became actively engaged in the Meuse-Argonne campaign, it made the old days on the Toul front and even St. Mihiel seem mild by comparison.” It was on October 24th, 1918 that would be the worst day of the war for the 103rd Field Artillery. That night the Germans opened a terrific bombardment on Rhode Island’s Battery C, where Brian was serving. Several direct hits were scored, and six men were killed. Despite the carnage, the men stood by their howitzers and their fallen brothers. They fought on until November the 11th 1918, when at 9:45AM an announcement was made that the Germans had finally surrendered. The soldiers celebrated, apart from Brian, who could only think of his friends that had died during the last few weeks and months, and the feelings of guilt that he was alive, and they were not. In December 1918 Brian and several survivors were in Paris on furlough, where he heard of and met Madeline. He was seeking forgiveness from his fallen friends, and wanted to speak with them, one last time to say goodbye’ Brian finally set sail back to the US on March 31st, 1919. So, the window for Madeline’s ‘relationship’ with Brian is between December 1918 to March 1919. There is another route in for the conman if you want to take it, Mrs Timmons husband died about six weeks prior to the letters being sent out, therefore it is possible, that Mabel is Strange2099's next intended victim, and may have been working on her for the past few weeks. That could work. That would mean that he and Madeline know each other from moving in similar circles in New York, and each have to worry about the other one blowing their cover. Oooohhh! Intrigues within intrigue! I like these ideas! I will write up my character background over the holiday weekend and post it for review. Stay tuned! Robert 'Bobby' Markwell is a British Police Constable, so nicknamed after Robert Peel who founded the principles of policing by consentPeeler, or Bobby, currently working in the outer boroughs of the Metropolitan Police area in London. Born in the late 19th century, Bobby grew up in the aftermath of the Jack the Ripper is the best-known name for an unidentified serial killer generally believed to have been active in the largely impoverished areas in and around the Whitechapel district of London in 1888. In both the criminal case files and contemporary journalistic accounts, the killer was called the Whitechapel Murderer and Leather Apron.Whitechapel murders, his fascination with which ultimately led him to join the Police as well as his more-than-passing interest in the psychology of crime. 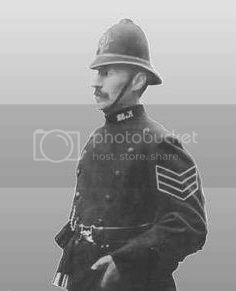 Already an adult by the time of the Great War, Robert has served in the Constabulary since coming of age, pounding the streets of the capital's less salubrious areas in his deep blue trenchcoat and custodian helmet, armed with nothing but a heavy wooden truncheon and signature whistle. A young idealist, Robert fought long and hard to stick to his principles - do unto others as you would have them do unto you - but time and experience have made him a grizzled veteran who quickly resorts to more violentvigorous means if his hard-earned powers of persuasion fail. Gone now is the optimistic and sharp-witted youth with the gift of the gab, learning all he can about the science of the mind to understand and catch criminals - too many years dealing with murder, vice and unbeknownst to him the occasional brush with the occult saw to that; too many beaten suspects, nightmare dreams that see him hitting the bottle, have seen this once respected officer relegated to leading the night duty in the outer suburbs armed with a British Bull Dog revolver and dispensing justice as he sees fit. Despite his propensity towards violence and intolerance for crime, Markwell is also fiercely loyal to his friends, colleagues and brethren. Somewhat lost in life, perhaps just going through the motions, deep down he hasn't lost hope of redemption. Roleplay sample It was with some trepidation that Sergeant Robert Markwell opened the hand-written letter with the Rhode Island postmark with an idle slice of a butter knife as he took breakfast in the section house after a wet and miserable winter night shift. Deep in thought, his food mostly untouched, he stroked his bushy, salt-and-pepper moustache and unshaven stubble. It had been a great many years since his fools' errand to Providence and he had not thought to hear from Brian again. It had been a nasty business. Had that been when the nightmares started? He couldn't tell, he reflected, ignoring his now-tepid mug of tea in favour of the flask at his hip. "Is everything alright sarge?" asked young Watkins. "You looked a bit far gone there." "You mind your bleedin' tongue there Young Watkins or I'll give you a clip round the ear 'ole!" he growled, looking up briefly at the fresh-faced young man who reminded him so much of his own youthful exuberance. "When you've been around as long as I 'ave then you can be cheeky!" A shudder ran through him and he took another slug of the cheap rot-gut he'd been drinking to take the edge off as a deep shudder of revulsion ran through him. The sanatorium? Is this what the nightmares had in store for him? A padded cell? He would have to go, he knew - they were brothers, square and true, and their bond was unbreakable. "Right Watkins!" he exclaimed - all bluster now - quickly covering for his weakness. "Run along to the yard and tell the Inspector that ol' sarge is goin' away for a while. Got some old debts to pay back Stateside..." Watkins nodded obediently. "Well, don't just stand there. Off with yer!" he said, watching the fresh-faced young recruit set off at a trot. Better pack me bags then, ain't I? OOC Hi folks! Been away from the site for quite a while due to illness - just dipping my toe back in the water. I've not played Call of Cthulhu before but I love the mythos. I have the 6th edition rulebook on PDF and have Herolab for character generation. I'm trying to get the whole bitter, damaged and scarred feel going on here. Last edited by Lord Ruthers; 12-27-2018 at 04:58 PM. The 1920's had been greeted by many in Boston with open arms. The City was recovering from the war effort abroad and had just gotten over the Police Strike in 1919. Governor Calvin Coolidge was liked by the majority of the citizens and unions seemed to be warming to the republican. Construction was at a fevered pitch as many boys and young men had come back stateside to find employment. Granville Patterson was an esteemed architect in Massachusetts and was taking on more work than he had seen in several decades. 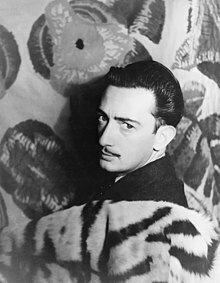 He was especially enthralled with the Italian Renaissance Style that he had witnessed in the historic cities of Italy upon his many trips there earlier in the 1900's. He had commissions for banks, churches, libraries and even a few hospitals. His firm was growing and he had recently taken on a few war veterans under his tutelage. One young man had been friends with Brian who had joined Granville on a trip to Providence to meet with a group about constructing a The Miriam Hospital is a private, not-for-profit hospital at 164 Summit Avenue in Providence, in the U.S. state of Rhode Island. It is a major teaching affiliate of the Warren Alpert Medical School of Brown University.hospital. He didn't remember a lot about Mabel but she may have been one of the women behind the fundraising efforts for the hospital. As he had a meeting planned in Providence later in July it would seem like a trip to meet with her would be possible. Last edited by Trmmilwwi; 12-28-2018 at 01:10 PM. Last edited by DJP1961; 12-29-2018 at 03:04 PM. Well I hope that you have had a full recovery from your illness, and life is treating you well. The window from meeting Brian is quite tight, he was in the UK for less than a month in 1917. However, how does this grab you? It was late one October night and Sargeant Markwell was treading his beat, near The Blind Beggar pub in Bethnal Green, the weather was miserable, both wet and cold, his thick coat kept the worst of the weather at bay. As he walked past the pub, he could smell the beer, and the urge to go in was almost too strong, but he resisted the temptation. He passed by a dark alley, and suddenly he felt the swift strike of a blackjack hit on his temple from behind. His vision blurred, and warm blood gushed from the open wound, severely disorientated by the blow he heard a thick east end accent with a slight Irish lilt, "You put my bruvver in hospital you fecking copper, lets see how you like it. Come on lads, get him down the alley, we'll give him a good kickin', and I'll carve the fecker up." Blows rained down upon Robert, as several people attacked him with both feet and fists, he was unable to focus on his assailants, they were wearing dark clothing, and that was about all he could make out. He was resigned to the fact he was probably going to die. Suddenly several figures wearing olive drab clothing appeared and barrelled into his assailants, a fist fight broke out. After a minute or so later the dark clothed figures ran off into the darkness. A couple of the figures in olive clothing helped Bobby to his feet, one recovered his helmet. Are you okay constable? asked one, the accent was unfamiliar to him, random thoughts ran through his mind as he mused, Canadian maybe. He was still breathing, and alive and who they were, or where they came from didn't really matter. He could smell the alcohol on their breath and all he could think of was god I need a drink. The four men escorted Bobby back top the nearest station, where he could get some basic medical attention. His vision was beginning to recover, his saviours were obviously soldiers and they wore a badge on the sleeves. six fleur-de-lys and a cannon with a single chevron all in yellow on a red background with the motto of Play The Game. It meant little to Bobby, maybe some artillery company. The soldiers gave their statements to the desk sergeant, and disappeared into the night. After a couple of days a letter arrived addressed to Sargeant Markwell, the letter was from Private Brian Timmons of the second battalion of the 103rd Rhode Island field artillery regiment battery C. enquiring as to his health. Booby sent a letter in return. Additional letters arrived every few weeks through the remainder of 1917, and into the beginning of 1918, mostly just inane chit chat of army life, some sections were inked out, but even Bobby could identify they were probably place names. The letters got more sporadic as 1918 drew on, only one letter a month, but the tone of the letters was much darker and grim tales of the harsh life in the trenches. Late November he received a letter that was positively filled with a morose sentiment. "It's over, I wish my friends were still here to share the joy, William and Harry bought it in the trenches when we came under bombardment from the hun. They were with me and Joey, when we found you in that alley. Going to Paris soon, to get away from this hell, maybe we'll be home soon. Maybe you could come over to the states sometime, we can share a drink and raise a toast to Will & Harry." Once Brian was back stateside, the letters continued to arrive every few weeks through the remainder of 1918, and up to December 1919 when the letters suddenly stopped. [OOC] Just think you've survived the great war, you get home in March 1919 to find the Volstead act had just come into force. Last edited by DJP1961; 12-27-2018 at 08:24 PM. Reason: It's 01:24 and I've been awake for 20 hours. Well I hope that you have had a full recovery from your illness, and life is treating you well. The window from meeting Brian is quite tight, he was in the UK for less than a month in 1917. However, how does this grab you? Just think you've survived the great war, you get home in March 1919 to find the Volstead act had just come into force. In answers to questions 2 and 3, I can make 1917 work. I'm not a history buff which means that (2) I'm not married to particular dates and (3) I hadn't actually considered that it was Prohibition Era, which is going to present some interesting ethical dilemmas for a visiting cop with a drink problem . Arthur Ford was born in Titusville, Florida and grew up in Fort Pierce, Florida. Raised in his youth by his deeply religious family, he had little choice but to follow in the footsteps of his father into the Clergy. He was subsequently ordained as a minister after finishing a degree in Theology at the Disciples of Christ school in Lexington, Kentucky. Initially serving at a church in Barbourville, Kentucky, the first World War saw him drafted and sent overseas to join the conflict at the age of 31. By the time the war ended, Arthur returned to the US changed in many ways - he had lost many friends, had gained a few new ones (among them, Brian Timmons), but most significant was the realization of his "psychic abilities". He claimed that while in the army, he could "hear" the names of soldiers several days before they would appear on casualty lists. Upon returning home after the war, Arthur spent a year as a traveling Spiritualist (psychic medium), eventually settling in New York City in 1920 as pastor of a Spiritualist church, where he specialized in reconnecting the bereaved with their recently departed loved ones. Arthur's convincing act and charismatic oratories gained him a notable following, as well as the attention of many rivals and skeptics. Though not yet in the habit of making 'house calls', a newspaper article noticed in June of 1920, about the recent passing of certain, wealthy individual by name of Mr. Timmons, caught his attention. Mr. Timmons was survived by his wife and son, Mabel & Brian. Arthur recalled having met a Brian Timmons from Rhode Island during his brief experience overseas in the war. Sensing that another client was ready for his particular skills, thus it was that Arthur packed his bags and headed off to visit Brian and Mrs. Mabel Timmons in the their family home in Providence, Rhode Island. Going with the idea that Arthur found out about the death of Mrs Timmons husband about six weeks prior to the other letters being sent out, and thus went early to help her 'connect' with her recently departed husband. Just an idea...perhaps it was Arthur who convinced Mabel to have Brian committed in the sanatorium (both because he was 'in the way' and because he was acting weird!)? Last edited by Strange2099; 01-01-2019 at 12:32 AM. Reason: Embellished backstory & added some tie-ins. Arthur Ford was born in Titusville, Florida and grew up in Fort Pierce, Florida. Raised by his family to be deeply religious in his youth, he was ordained as a minister after finishing a degree in Theology at the Disciples of Christ school in Lexington, Kentucky. Initially serving at a church in Barbourville, Kentucky, the first World War saw him drafted and sent overseas to join the conflict at the age of 31. By the time the war ended, Arthur returned to the US changed in many ways - he had lost many friends, had gained new ones (among them, Brian Timmons), but most significantly was the realization of his "psychic abilities". He claimed that while in the army, he could "hear" the names of soldiers several days before they would appear on casualty lists. Upon returning to the States after the war, Arthur took up as a traveling Spiritualist (psychic medium), eventually settling in New York City as pastor of a Spiritualist church. 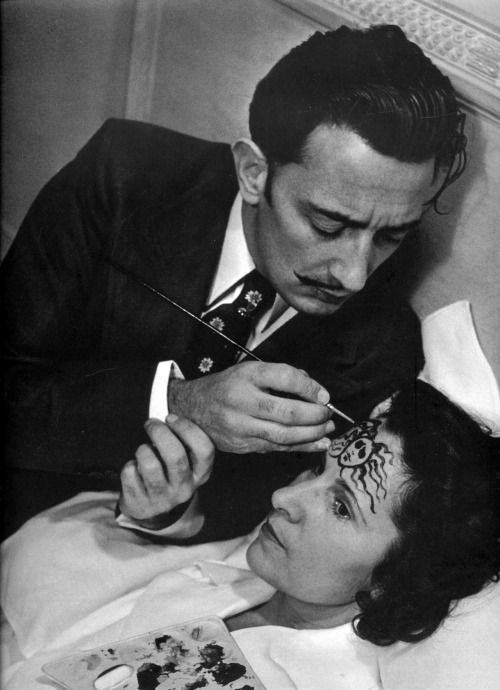 Salvador Dali and his fine moustache. No, I'm good. 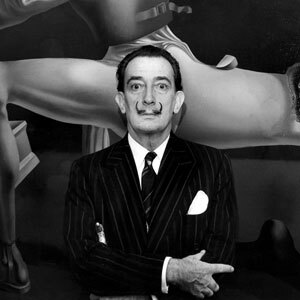 I was a fan of Dali and surrealism as a kid, and still am. I used to have a poster of the Temptation of St Anthony on my wall. Thanks for letting me use the photo! FYI, I updated the char bio, which should now be complete. @Touketsu - I noticed that your char was an Investigative Reporter, also from NYC? I hope you don't mind that I included a connection. I thought it quite interesting that so many of us were operating in NY! My intention is to post a private message to each player tomorrow, it's purpose is to determine who arrives at the Timmons' residence first, and the player's first interaction with the butler Jarvis. Once everyone has replied, I'll post it up in the story folder.